82Corp. had the most liked content! Trump administration set to end sanction exemptions for nations importing Iranian oil: report The Trump administration is set to inform five nations that they will no longer be exempt from U.S. sanctions if they continue to import oil from Iran, reports said Sunday. Secretary of State Mike Pompeo plans to announce the policy move on Monday, which would no longer renew sanctions waivers for allies Japan, South Korea, and Turkey. The other countries no longer exempt are China and India. The waivers for sanctions will expire on May 2. The Washington Post first reported on the move, and three sources confirmed the report to the Associated Press. President Trump finalized the measure on Friday, according to the Post, in an effort to apply “maximum economic pressure” by cutting off its oil exports and reducing its main revenue source to zero. In reaction to the administration’s move and expectations of tightening supply, early trading on Monday indicated Benchmark Brent crude oil futures rose by as much as 3.2 percent to $74.31 a barrel, the highest since Nov. 1, Reuters reports. The Associated Press contributed to this report. https://www.foxnews.com/politics/trump-administration-set-to-end-sanction-exemptions-for-nations-importing-iranian-oil-report Things are heating up for Iran. "In" five years or before? I've been invested since 2004. This feels like a turtle head poking out probably pass like a good Fart. 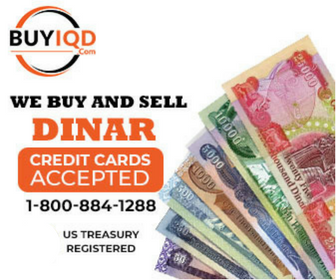 When Iraq's told to release IQD internationally they will do so. When that is, we continue to guess. Best wishes to all. Correct H.R.5405 has been signed not yet schedule for a passage vote. It could be another 12 months before it's scheduled for a vote. There are lots of things at play more than just the dinar being reinstated and revalued. Yes, also check out H.R. 5404, everything is being played out. Think we are part of history. I sure do remember that statement. Has anyone else listen to X22 Report, Robert David Steele is the guess speaker. What he says 03:30 - 04:45. A trillion dollars injected into the US economy from the bottom up. Robert David Steele was nominated in 2017 for Nobel Peace Prize, written several books. POTUS reads and listens. Huge investment by Saudi Arabia, 1 Hectare = 2.47 Acre, or…. 1 million Hectares = 3,861 Square Mile. Anyone else have ISX (Iraq Stock Exchange), good time to invest in chicken and cows. Would it be racist or simply a cultural difference their not raising Bacon. If you want to know how to invest in Iraq, it goes through USACC. In addition to no interest received. Anyone else having problems opening or printing their reports. I've had my account since 25/01/2010, not had any issues with interest received, personal checks, credit card or password resets. Can only hope the time has come on this investment.